#9 A New Western Normality in the Making? WW 2 generated savings, pent-up demand and few foreign few competitors generated 25 years of high profits higher wages and cooperative unions. As if Watergate and the Cold War were not enough, the oil cartel OPEC had the unity to succeeded with a 1973-74 oil embargo. The embargo was targeted at nations perceived as supporting Israel during the recent Yom Kippur War. Trouble was brewing. 1980's U.S. and England Returned to Conservative Lax Business Regulation because increased regulation and increased welfare provisions had upset many voters. Think Great Society and lax derivative regulation which result in major increases hostile leveraged buyouts plus and over-investing in Real estate caused. They caused the Savings and Loan Crisis. Think Michael Milken Scandal, Keating Five results from poor Alan Greenspan advise. 1986 Big Bang deregulates London's financial services industry, other will follow. 1999 Gramm�Leach�Bliley Act Increased Systemic Financial Risk once limited by the Glass-Steagall Great Depression Act. Initiated by Republicans it was signed by President Clinton. 1. 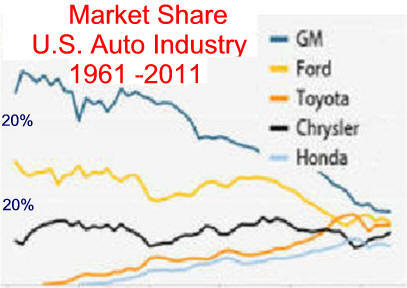 Great Moderation preceded the Great Recession 2. 2007-8 Financial Crisis was tamed by the Federal Reserve. 3. 2008-9 Recession was tamed by both monetary and fiscal policy. 4. European financial instability and world-wide austerity slowed economic recovery and income growth for all but the very, very, very wealthy. Think top 1/10th of one-percent. They are infrequent, severe, and long-lasting. Understanding them is necessary when judging society's efforts to manage The Great Recession. It is like understanding a doctor's attempt to relieve a headache requires knowing the level of difficulty. Was it a Migraine Headache? A balance sheet is caused by high levels of private sector debt. Assets must equal liabilities plus equity. If assets values like housing collateral fall below their associated debt, equity must make up the difference or insolvency results and debt must be repaid. 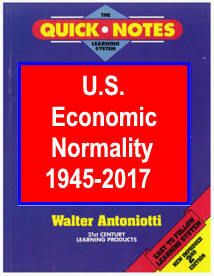 Think 1837, 1873, 1890 & 1929 See Most Severe US Recessions. derivatives, securitization, credit default swaps all managed by hedge funds. 2. Savings glut created as emerging countries lowered borrowing and increased trade surpluses after the 1997 Asian Debt Crisis made their foreign dollar dominate debt unsustainable. They expanded trade and kept personal consumption below economic growth. Less consumption and borrowing plus a trade surplus increased Dollar, Euro, and Yen reserves. Like the Petro Dollars in the 1980's this excess savings would be loaned for poor investments (housing). Think savings from China and Russia and other re. 3. 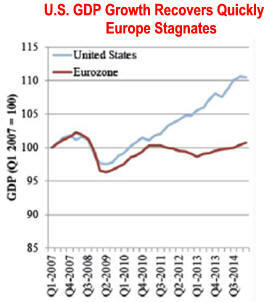 Aggregate demand stagnated as trade surplus countries didn't spend. Germany's 2005 economic renewal was saved and Japan's private sector saved much more after their 1990's credit bubble exploded. Adding to the demand shortage were companies who maintained profit by decreasing capital investment spending despite historically low interest rates. 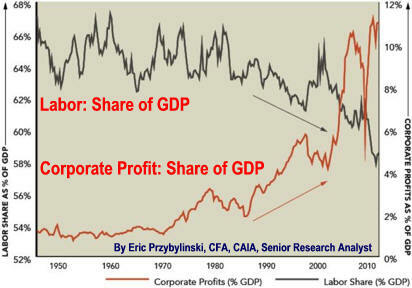 Globalization and technology also helped them maintain profit as wage increases were limited to most valuable employees. State and local governments, especially those with underfunded pension systems, also cut expenditures. 4. Increased current account deficits by wealthy nations balanced world trade. Higher demand for foreign goods was made possible by massive central bank supported low interest loans. The FED's historic monetary expansion was made possible by continued low inflation caused by expanded Flat World competition and low oil prices. Innovative financing and lax financial regulation also fostered expanded financial asset demand. Think excess OPEC savings financed the 1970's Latin American Debt Crisis leading to Savings and Loan Crisis. 5. 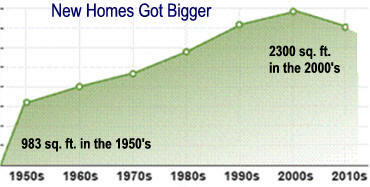 Real Estate and Stock bubbles came as expected from low long-term real interest rates. New home buyers borrowed surplus savings and investors devoured growing unique debt securities created by an expanding finance industry promising insured difficult to understand almost guaranteed financial instruments. Leverage rose dramatically. Fraud, near fraud and data manipulation exploded as mortgage servicers, banks, and the law firms broke the law to force people out of their homes. See Chain of Title and Brief History of Financial Bubbles. See Bubbles Credit and Their Consequences to see FED analysis of trying to slow down a bubble. Bailout History The $700 billion 2008 financial-sector rescue plan is the latest of many bailouts that go back to the Panic of 1792 when the federal government bailed out states over-burdened by their Revolutionary War Debt. Thereafter private banks and investment bankers took over financial bailouts until the Panic of 1907 when the economy was so big that even J.P. Morgan needed U.S. Treasury help. This led to the 1913 Federal Reserve System designed to be the lender of last resort. Recently the 1987 Savings and Loan Crisis bailout cost about $160 billion. Other recent government private sector bailouts have included: 1970 Penn Central 1971 Lockheed 1980 Chrysler 1984 Continental Illinois 1991 Executive Life Insurance Company by states assessing other insurers and the 1998 Long-Term Capital Management bailout by commercial and investment banks. New Normality #5 Poverty Rate Stuck at 15.5%. After "...correcting the 2013 poverty rate for noncash food and housing benefits, refundable tax credits, and the upward bias in the CPI-U ..."the rate drops from 14.5% to 4.8%. War on Poverty-Was It Lost Others believe it should be raised as it doesn't account for geographic and demographics differences. See Poverty Rates How Flawed Measure Drives Policy Other Data 1 Data 2 Think many use true but not necessarily appropriate data to foster their POLITICAL beliefs. Example: With our obesity problem how could anyone have believed that many went to bed hungry during the Great Recession. Calculation ignored food stamps and subsidized school lunches. Editor's Note: Competition for US Investment dollars meant business located in US had to compete with developing countries whose R was greater than R from US located companies. Just as said competition lower US worker wages except the return on investment overseas avoided taxes and to some extent measuring of R.
Automation Will Continue, What Will Displaced Workers Do? 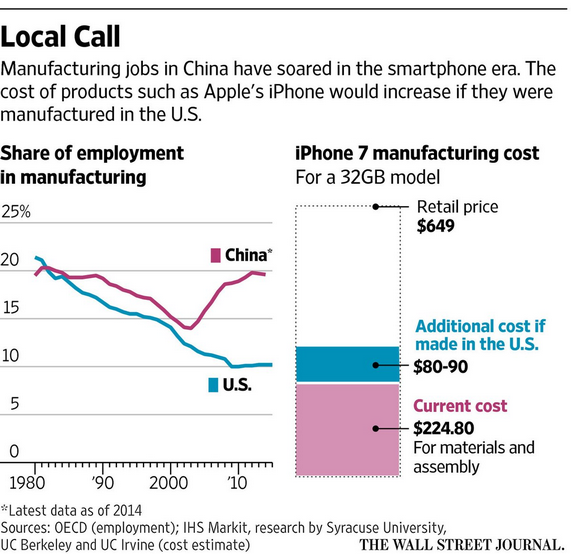 Should We Encourage Apple to Assemble Onshore? How? 1. States are a monopoly on a legitimate use of physical force. [107 from Max Weber States are about Power! 3. Rule of Law: sovereignty responsible to same laws as the governed. Laws limit power. government that serves the entire population, not just the elite. Both state moved to Oligarchy where a few wealthy people form a Plutocracy. Neither can protect citizens and provide services to much of the population. second revolution needed to avoid a strong connection to Russia. Elected strong leader but he to is failing. new set of party connected bureaucratic. Strong unions kept jobs for previous bureaucrats. Eventually, she had seven times the bureaucrats per person as did England. Problem: Greece does not want to change. Opposition to immigrants, globalization, and establishment leaders/institutions created disruptions. America's 1990 dissatisfaction recently spread to Europe causing two years of volatile pubic fury. This spread compounds to an unpredictable degree the possible disruption to Europe and Western Culture. Status and Social Cultural Apprehensions contributed to these disruptions. This caused effected groups to lash out in a tribal like response. All three disruptions could last years Axion reported here, here and here. would help moderate our disruptions. Disruption modification related to Trump, and Brexit, power immigrants are difficult. 2. An aging and shrinking developed world's population reinforces disruptive forces. 3. Climate change is increasing leader constitution. A New Normal is in the Making?